The White Uniforms of the French Army, 1806-1807 by Guy C. Dempsey Jr. Described by Guy C. Dempsey Jr., illustrated by R. J. Marrion. One of the most curious episodes in the history of military costume in the Napoleonic era was surely the experimental use of white uniforms by French infantry during the early years of the First Empire. The French army had been clothed in white since its first un-iformed troops were raised during the reign of Louis XIV and, in fact, the army had only reluctantly traded that colour for a more egalitarian blue during the tumultuous years of the French Revolution. Yet when Napoleon attempted to re-introduce the white coats in 1806, their return aroused little enthusiasm. Their use was judged economically impractical, and within a year the project had been quietly discontinued, leaving only the unusual sartorial note of white-coated French soldiers on the battlefields of Austerlitz, Jena/Auerstadt, Eylau and Friedland to mark its passing. It would seem that even in the hey-day of colourful military dress, traditions were easy to eliminate and difficult to revive. The initial impetus for this experiment was most likely provided by the dissatisfaction of the many soldiers in Napoleon's ranks who had once served in the royal army. In the period of relative calm following the peace of Amiens, these veteran officers and men had the time to make an unfavourable comparison of their own rag-tag appearance with, the memory of the dazzling elegance of the white uniforms they had worn under the ancien regime, and they were not at all hesitant to voice their opinions. These grumblings eventually came to impress even members of the French army's high command. Inspector-General Baraguey d'Hilliers, for instance, concluded one report with the observation, "I have noted a universal desire for a change in the colour of the uniforms". Such agitation, of course, would not necessarily have come to any practical result. In this particular case, however, it happened to coincide with the development of a peculiar economic situation which provided a more compelling rationale for the change to a white uniform. As a result of Great Britain's blockade of the Continent, the French found themselves in 1804 cut off from all major sources of supply of indigo, the key ingredient of the dyes used to make the blue cloth for French uniforms. At first, the Ministry of War tried to find domestic substitutes for the substance, but these proved to be relatively inefficient and particularly expensive. The Ministry then began to consider in earnest the possibility that a change in the basic colour of the French uniform might serve as a solution to its problems. Finally, on the basis of extensive research, the Ministry put a formal proposal to the Emperor, and on February 13, 1805, Napoleon authorised the trial use of white uniforms by the third battalions of the 18th line and 4th light regiments. These units received the new uniforms in the spring of 1805, and it is possible that they continued to wear the white coats even during the Austerlitz campaign. The considerations of that same campaign also served, however, to distract Napoleon's attention from such frivolous matters as the appearance of his troops, and final disposition of the project as a whole was consequently held in abeyance until early in 1806. Napoleon was apparently satisfied with the trial run of the new white uniform, for on April 25, 1806, he decreed its adoption for all the regiments of line infantry, beginning with the 3rd, 4th, 8th, 12th, 14th, 15th, 16th, 17th, 18th, 19th, 21st, 22nd, 24th, 25th, 27th, 28th, 32nd, 33rd, 34th and 36th regiments. The entire re-uniforming process was expected to be completed by 1809. A second decree issued on July 24 specified particulars of the new uniforms, which were intended to be practical and colourful at the same time. The heart of the uniform regulations was an elaborate design for identifying each regiment by means of a unique pattern of coloured facings and trim on its new white coats. The 112 line regiments were divided for this purpose into 14 groups of 8 regiments, and each group was assigned a distinctive facing colour: regiments 1 to 8, Dark Green; 9 to 16, Black; 17 to 24, Scarlet; 25 to 32, Dark Brown; 33 to 40, Violet; 41 to 48, Sky Blue; 49 to 56, Pink; 57 to 64 Light Orange; 65 to 72, Dark Blue; 73 to 80, Yellow; 81 to 88, Grass Green; 89 to 96, Madder Red; 97 to 104, Crimson; and 104 to 112, Iron Grey. Within each of these groups, the first four regiments had yellow metal buttons and horizontal pockets on their coats, while the second four had white metal buttons and vertical pockets. The units within each of these series of four were then further differentiated according to the following formula: the first regiment wore the distinctive colour on lapels, collar and cuffs; the second, on lapels and cuffs; the third, on lapels and collar; the fourth wore it on collar and cuffs alone. Any facing left white was trimmed in the distinctive regimental colour and all facings in the distinctive colour were piped with white. Throughout the spring and summer of 1806 the French magazines were the scene of frantic activity as the new uniforms were produced for the army, yet surprisingly, the uniform specifications seem to have been followed quite closely in the manufacturing process, with the exception of the addition of yellow collars to some voltigeur uniforms and some slight confusion as to whether the turnbacks should be in white or the facing colour. It is apparent from physical and documentary evidence, however, that there were some irregularities in the actual distribution of the finished product. In the end, it seems that only 12 regiments, as opposed to the 20 initially designated, were actually issued the white uniforms, and 3 of these were not even among those mentioned in the original decree. (See accompanying chart for a full listing of these regiments.) In addition, many officers of regiments retaining the blue uniform are thought to have purchased white uniforms on their own for reasons of high fashion, although in all cases officers retained their reliable blue surtouts for campaign wear. The critical test of the white uniform came swiftly after its adoption and, unfortunately, the results were discouraging. During the course of the rugged Prussian and Polish campaigns the major drawbacks of the white uniform became, literally, all too clear. The white coats certainly made a splendid impression on parade, but in the field, as one officer put it, "they were impossible to keep clean … and in action, blood showed up vividly on them, a fact which produced an unfortunate effect on the morale of the men". Napoleon himself is said to have been appalled at the sight of the white-coated casualties and survivors of the gruesome combat at Eylau in February of 1807. The fatal flaw of the white uniform was not, however, simply this aesthetic failing; the fact that the white coats soiled so easily meant that they were also uneconomical. While the blue coats were more expensive to produce, they had the merit of being durable. As a result, on May 23, 1806, the Emperor ordered further distribution of the white coats halted, and on June 26 he delivered the definitive coup de grace to the new uniform: "I am very displeased with the white coats." The Ministry of War completed the necessary paperwork to carry this sentiment into action with administrative orders on September 24 and October 2 halting use of the white uniforms by all units. The return to blue uniforms was, in practice, a sporadic operation. Many regiments simply kept the white coats until they wore out, and that seems to have been a lengthy process as certain units in Spain were still wearing white uniforms in 1809. The regiments which remained with the Grand Army were undoubtedly quicker to abandon the white coats, to the great dismay of many who had made special outlays for the new uniform. The following lamentation by an officer of the 15th regiment in 1807 reveals, among other items, how rarely French officers wore full dress uniform during a period of active campaigning: "I only regret having been obliged to buy new uniforms which resulted in a useless expenditure of 200 francs. The Emperor re-instituted the blue coat after only a short time and of the two white uniforms I purchased I wore one only a few times, and the other never." And so the grand scheme for re-uniforming the French army faded quietly away. It is interesting to note, however, that the Emperor and the Ministry of War never put the thought of white uniforms completely out of mind. 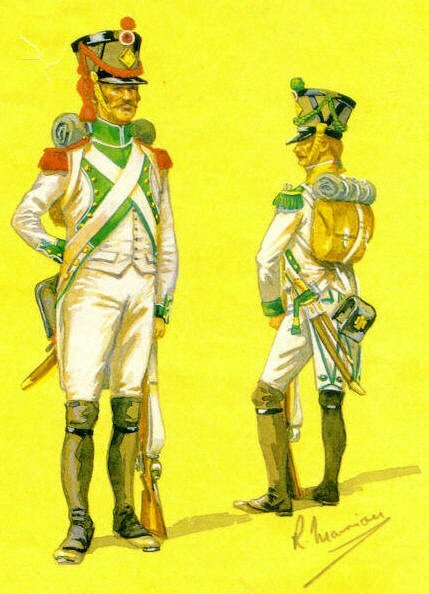 In 1810 the two regiments of Carabiniers were given luxurious new white uniforms, and here again the choice was dictated both by preference and by economic necessity, Finally, in the twilight hours of the First Empire, it was again proposed to issue white uniforms to the French infantry, this time for the very grim reason that the losses of the army in 1813 caused there to be insufficient blue cloth to uniform the new Marie-Louises of 1814, but this ironic encore to the experiment of 1806 never reached fruition. 1. Facings in the distinctive colour were piped white: those in white were piped in the distinctive colour. 2. According to regulations, the turnbacks of the coat were white, but in practice they were often of the distinctive colour. 3. Cuff flaps were the same colour as the cuffs. The white uniform coat showing positions of the pipings and buttons; refer to chart above for individual regimental distinctions. Guide a I'Usage des Artistes et des Costumiers, Paris, 1904; Assorted manuscripts in la Musée de l'Armée.